is policy failure really unexpected? Cigarette sales rebounded in the first quarter of this year, after a sharp decline early last year due to an increase in prices, according to a Yonhap news report. 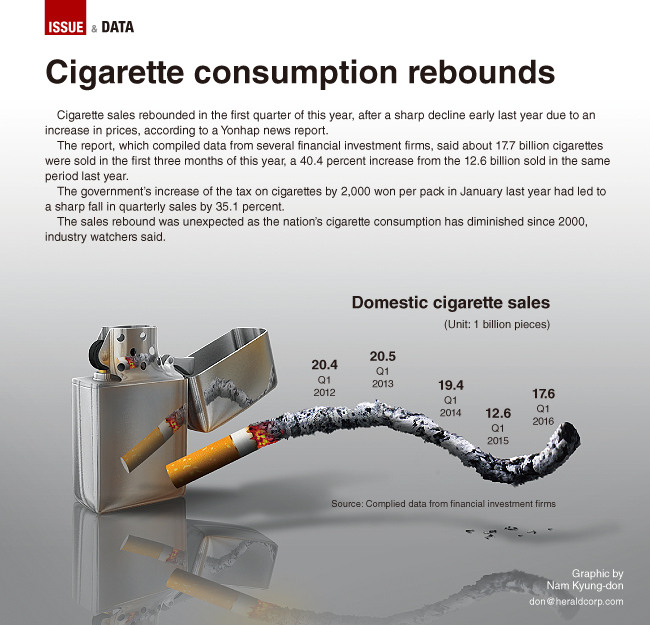 The report, which compiled data from several financial investment firms, said about 17.7 billion sticks of cigarettes were sold in the first three months of this year, a 40.4 percent increase from the 12.6 billion sticks sold in the same period last year. The government’s increase of the tax on cigarettes by 2,000 won per pack in January last year had led to a sharp fall in quarterly sales by 35.1 percent. The sales increase was unexpected as the nation’s cigarette consumption has diminished since 2000, industry watchers said.